"The Ultimate Way for Kids to Learn History!" Download Your 1st Issue FREE when you subscribe! 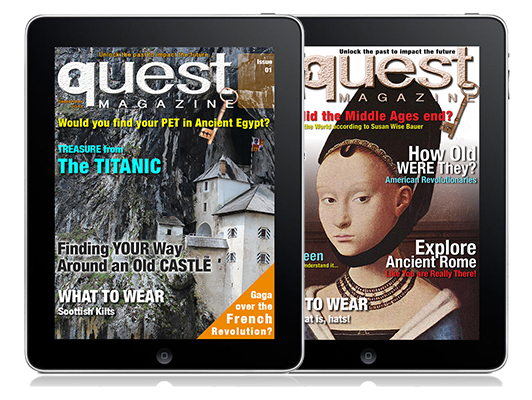 Quest Magazine is THE world history magazine for kids, families, educators, and history buffs. Stunning photographs, gripping stories and intriguing articles, detailed maps and timelines, bring the past to life. Currently available only on Apple's newsstand. Quest Magazine subscriptions available: A single issue for $3.99 (non-subscription) 1-month subscription for $1.99 or 12-month for $18.99, automatically renewed until canceled Payment for all purchases will be charged to your iTunes or Google Play account at the confirmation of your purchase.